Sebring, Florida, police chief Karl Hoglund wipes his head as he listens to Florida Gov. Ron DeSantis speak during a news conference, Jan. 23, 2019, after authorities said five people were shot and killed at a SunTrust bank branch. A gunman opened fire inside a Florida bank Wednesday afternoon, killing five people before surrendering to negotiators, police said. 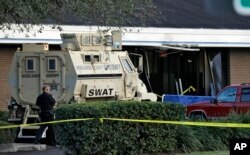 A Sebring, Florida, police officer stands near a Highlands County Sheriff's SWAT vehicle that is stationed in front of a SunTrust Bank branch, Jan. 23, 2019.